Below is the poster for the 1981 comedy Chu Chu and the Philly Flash, which I actually saw part of on bad, old movie channel KICU-San Jose (channel 36) during a terrible, rainy Sunday in junior high. You don't need to see it. 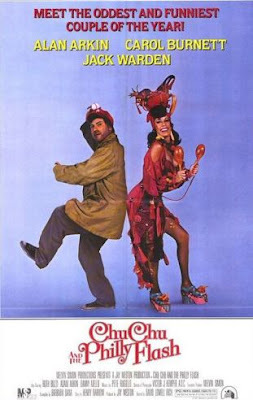 The poster tells your everything you need to know: Alan Arkin meets up with Carol Burnett, for some reason, and Carol Burnett is dressed like Carmen Miranda, again for some reason. Well, that and the following sentence from the film's Wikipedia page: "The film was panned by critics and was not a box office success." Well, that and the following cast note: "Also with Ruth Buzzi as Consuelo."